Environmental problems are first and foremost problems of relationship, where faulty interactions between individual human and more-than-human beings scale up to create various large-scale environmental crises. The origins of these problematic interactions lie in modern assumptions about what is possible in these relationships—specifically about what capacities more-than-human beings have to enter into them. This is ontology, where differences in ontological concepts should not be attributed to differences in human beliefs alone, but instead to the accuracy of interpretation of human-nature relational experiences. Modern humanist assumptions operate to distort these interpretations so that they are seen as not containing reciprocity or closeness. Such assumptions are traced to ecofeminist “human/nature dualisms” where humans are pre-installed as superior to reduced/inferior more-than-human partners. 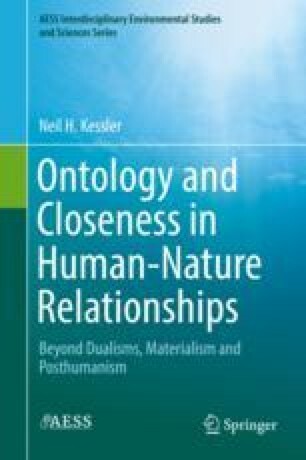 The book focuses on closeness both for its ameliorative effect on human-nature relationships and to convey that closeness is inherent in these relationships, but has been post hoc eradicated by human/nature dualisms.